Climate variability and extreme events have been affecting African countries in a variety of ways. Increases in temperature, erratic and erosive rainfall and soil erosion are leading to damages to ecosystems and its endogenous resources (land and sea) have been negatively influencing ecosystems services. It is widely believed that the promotion of sustainable land use practices, the identification of alternative ways to gain livelihood from the use of agriculture, of smarter use of forestry resources and of the means to enhance and upkeep income generation, are essential in attempts to enhance food security in the African continent. Highlighting this background and the specificities of local communities in African countries the "Symposium on climate change, agriculture, fisheries and food security in Africa" will be a truly interdisciplinary event, mobilizing scholars, social movements, practitioners and members of government and non-government agencies, undertaking research and/or executing projects focusing on agriculture, fisheries and food security in African countries. The symposium will focus on "Integrating Mitigation and Adaptation Strategies to Enhance Sustainable Agricultural Practices, Sustainable Fisheries and Food Security in the African Continent", meaning that it will serve the purpose of showcasing experiences from research, field projects and best practice to foster sustainable agricultural, sustainable fisheries and food security under a climate change context among countries in the continent, which may be useful and/ feasible of being implemented elsewhere. 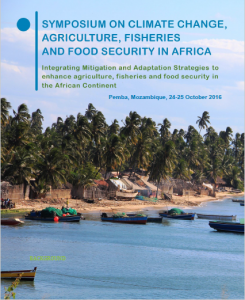 The symposium will be held in Pemba, Mozambique, 24-25 October 2016. For further information such as the schedule and application deadlines click here.